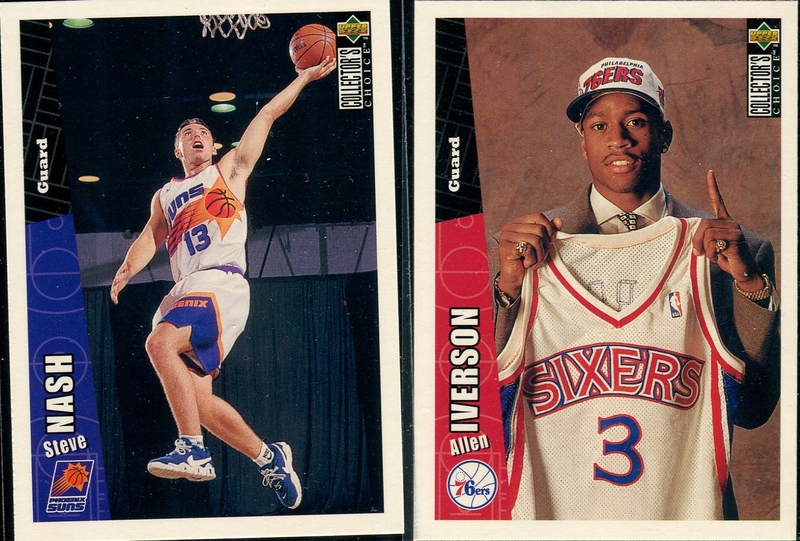 With the basketball season just around the corner, it's time for another basketball post. This time, I attempt to finish my goal of completing the 1996-97 Collector's Choice set. It's a simple, colorful set. I picked up two boxes on eBay (even though I needed only 1), as the price per box was cheaper than what else was available. So, as a side note, if you're looking for a box of this product, I'm your man. After flipping a coin, I settled on a box to open. I'm sure you're all tired of seeing these cards so there's a good chance you won't have to hear about this set again! Much like the last time, I'll provide a statistical breakdown to see if I beat the odds. There were 36 packs with 12 cards per pack, for a whopping 432 cards. Six cards might not seem like much but for all the base cards that are included, this is not a good collation of cards. 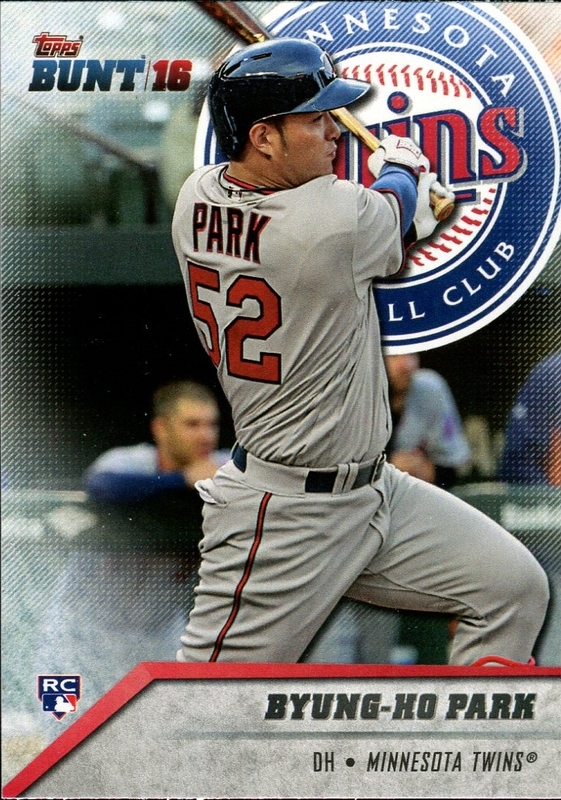 Fortunately, Sportlots makes it easy to pick up base cards at $0.18 a pop, which is what I did to finish off the set. Other than missing one stick-ums card, this box treated me well. Pulling the trade update card was a nice plus. Too bad I can't redeem it as the update cards are hard to find on the secondary market. Even though I didn't complete the base set for series 2, I managed to finish the base mini-cards. Going into the box I only needed 13 cards so I'm glad I didn't get burdened with too many duplicates. It's nice to finally close the book on this set. I'll chase down the remaining insert cards I need, as well as the update cards. So this wraps it up for Collector's Choice! 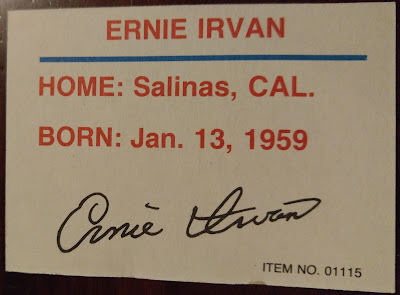 I would like to give a HUGE thank you to the guys over at Beckett Radio for running the contest that netted me the card below. My Griffey collection is small compared to most other collectors out there. He was a favorite of mine as a kid but most of my collecting energy went to basketball. 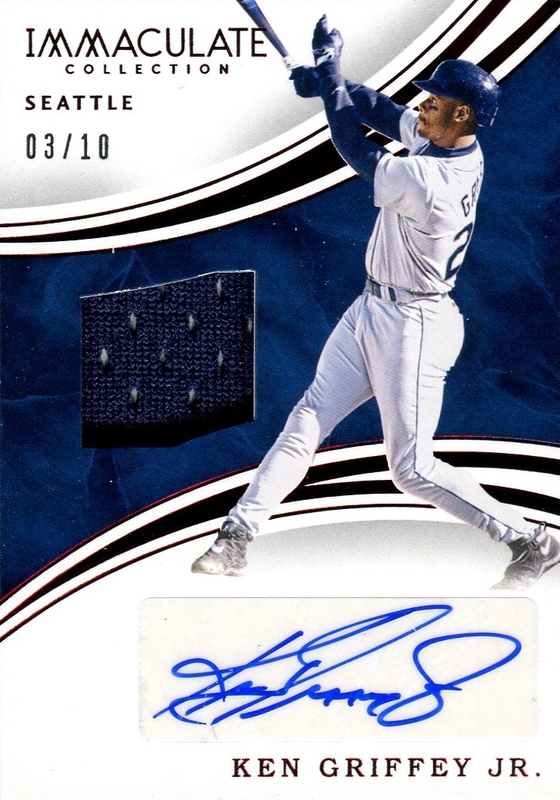 As I've been building my Griffey collection, one type of card I had hoped to collect was an autograph card. I figured wasn't going to buy one as they are quite expensive (although I only looked recently for this blog post). A couple weeks ago I entered a random drawing through Becket Radio to win an autographed, relic card of Griffey. Everyone and their brother seemed to be entering as the number of entries climbed higher and higher. I submitted my requisite entries and went about my day. Last week, moments before I was to start my job interview, I received an e-mail from Eric at Beckett informing me I won! WOW! Fast forward to today. One of the sweetest swings in baseball showed up in my mailbox. This card truly is immaculate. A low serial number, only to 10. A colored, as opposed to white, jersey (I'm assuming) swatch. The red foil lettering does not show up well on the scan but it looks real nice in person. Lastly, a very nice looking signature. Griffey obviously takes some pride in his signature. It's a sticker autograph but frankly, I don't care if an autograph is on a sticker or not. I understand the argument that an on-card autograph is better because it means the player actually held the card. However, I'm fine with receiving a player autograph in any capacity. So long as the autograph fits on the sticker and the sticker is on straight. Here, Griffey signed 100% on the sticker and it was placed on straight. That's it for today's post. No other cards are worthy enough to be included in the same post. Pullman, Washington and Moscow, Idaho are separated by a mere 8 miles, located in the heart of the Palouse region. The short distance makes for a perfect storyline across all sports between two Division I schools, Washington State University and the University of Idaho. This rivalry is known as the Battle of the Palouse. I wouldn't call this a storied rivalry, at least not between the football teams. Well, you could but the story is that WSU beats up on Idaho and Idaho limps back home. Idaho has always been overmatched. WSU's 56-6 victory on Saturday over Idaho is a picture perfect reflection of how the games have been played for these two teams. 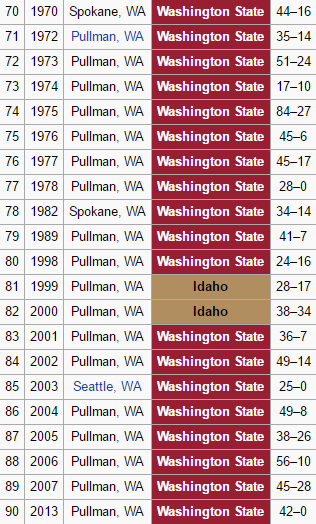 WSU leads the series 71-17-3 and the last 20 games have been lopsided. This might be the last time the Cougars see the Vandals. Starting in 2018, the Vandals will drop down to the FCS and join the Big Sky conference. The two schools have stepped away from meeting annually so I think it is unlikely we will see Idaho next year. If so, Saturday's resounding victory is a great way to end the series. Jason Gesser, who was inducted into the WSU Athletics Hall of Fame prior to the game on Saturday, played in several WSU/Idaho games. 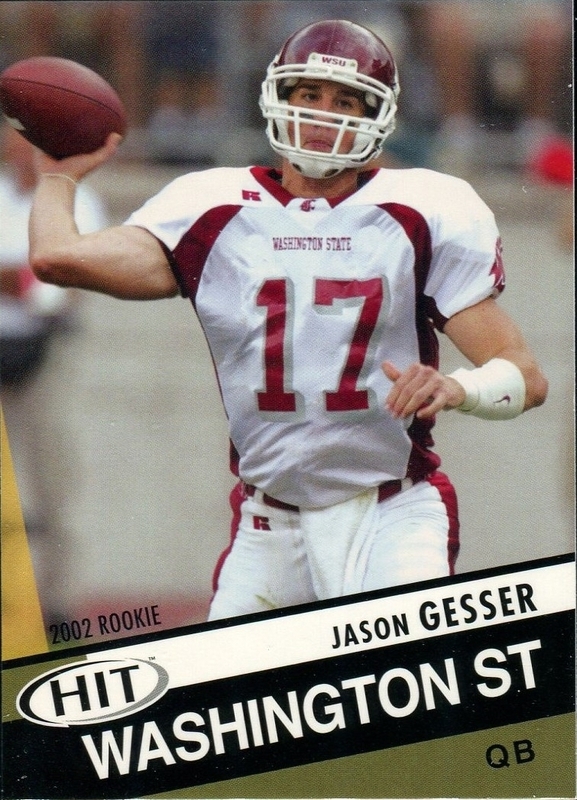 Gesser was the quarterback during one of WSU's rare losses in Idaho, in 2000. However, he was able to close out his college career with a big 49-14 victory against Idaho. 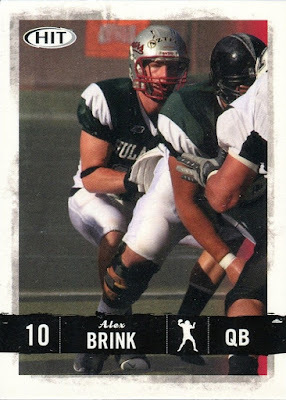 Brink was the quarterback I saw the most of during my years at WSU. Alex Brink played in all four WSU victories from 2004-2007. His best game was in 2007 when he threw for over 300 yards and 4 touchdowns. 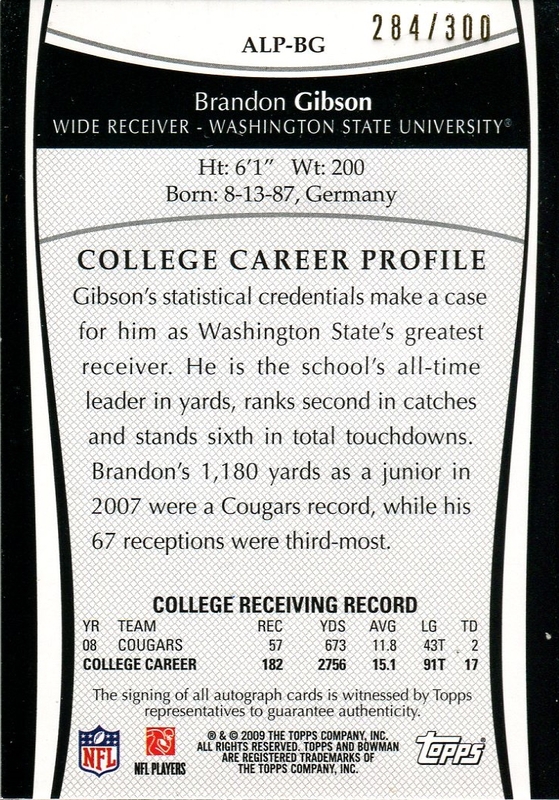 Lastly, Brandon Gibson, a player who I have mentioned before. 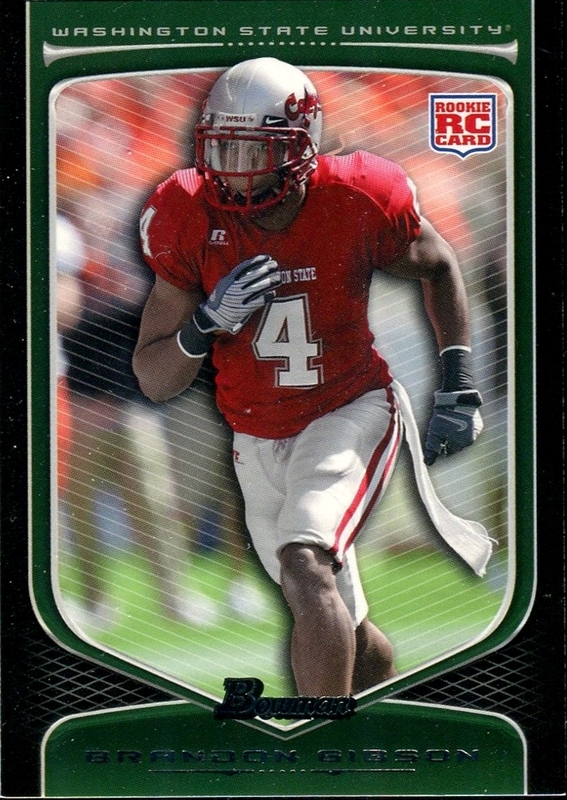 His most prolific game against Idaho came in 2007 when he had 81 yards and 1 touchdown. The theme from these brief player write-ups has been points. WSU likes to score a lot against Idaho. The Idaho games always serve as a nice heart relief from the typical nailbiters. 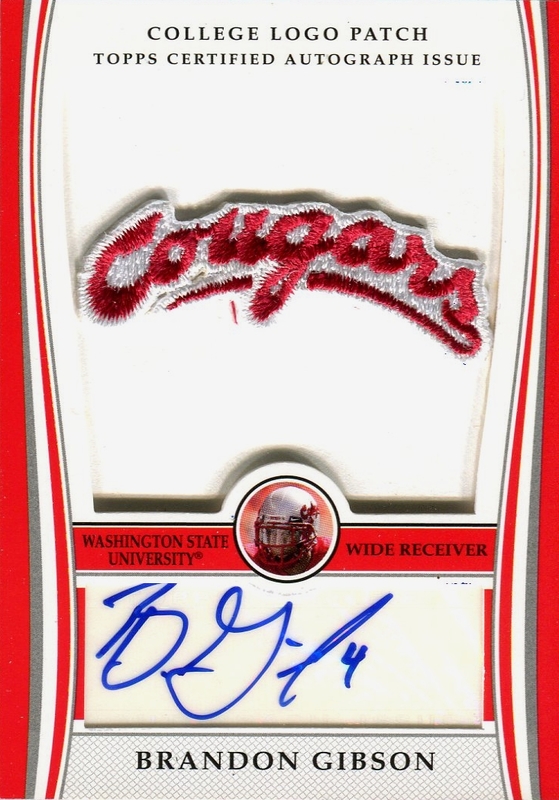 Next week WSU has a bye but I'll probably still throw up some WSU cards on the blog anyway. I should probably plan out some sort of schedule for these posts but who likes to do that? It's been a somewhat stressful week for me. I had a call-back interview for a position I was really excited about, which meant that this second would entail meeting with the bigwigs of the firm, as well as a slew of associates. This was my chance to try and establish a personal connection since I knew they already felt I was qualified. I was told at the end that they had hoped to make a decision at the end of the week. Friday came and went without any update. I felt like I did well in the second interview so I'm not too worried that I didn't hear anything. Still, Friday was nerve racking because there was the possibility I would hear something. To relax at the end of the week I picked up a pack of 2016 Topps Bunt. Bunt is Topps' mobile trading card app. To bridge the digital divide, Topps released a physical version of the Bunt cards. 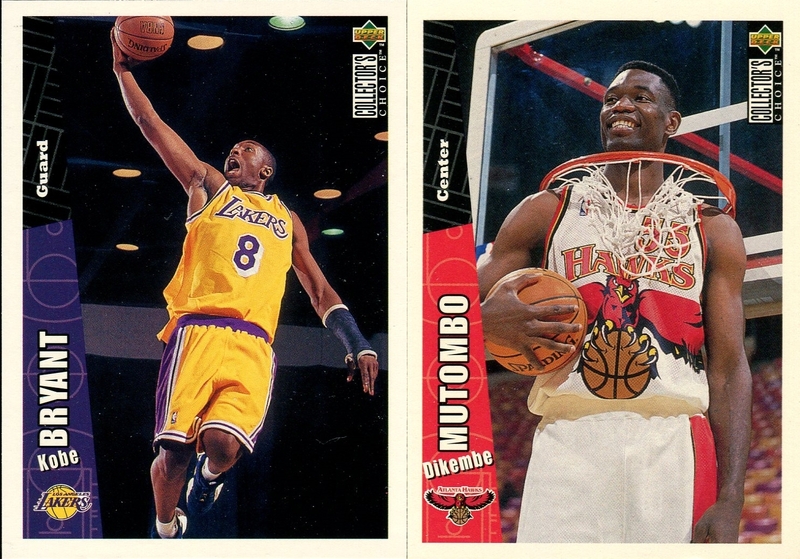 I'm sure I'm not the only one who does not care for digital cards so a physical version holds little appeal to me. Nonetheless, at $1 a pack I had to try out a pack. I had low expectations going into this pack. After opening it, I certainly did not have my expectations exceeded. If this pack was any more than a dollar I would have been disappointed but thankfully it was cheap. The giant logo in the background is distracting. The gray nameplate is drab. The photography is close-cropped on every card and the shots are standard. I think the Donaldson photo is my favorite out of the pack. 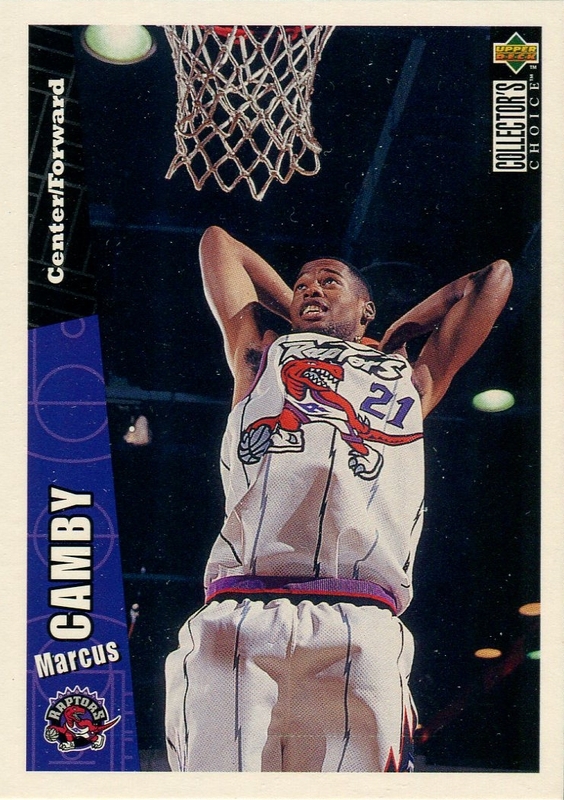 It might not show up on the scans too well but there is a mostly transparent overlay around the edges of the card. I feel like that's supposed to give the cards a pixelated effect because you know, digital cards. I don't mind it, though. 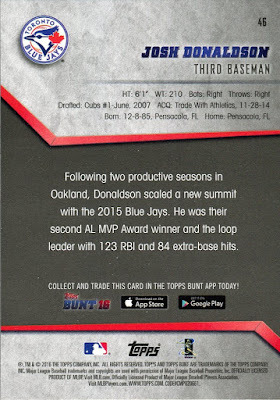 Although that damn smoke from Topps flagship makes an appearance on Bunt. Not a fan of the smoke. The back of the card is what you would expect from a set like this. Simple design with a quick blurb. For a $1 pack, this is a cheap, no frills option. Given that it's hard to find inexpensive packs these days this a nice change. However, you get what you pay for, which is a few basic cards. Today I present to you a rare NASCAR post. Rare in the sense that I will rarely ever make a NASCAR post. I don't follow the sport anymore and I have no desire to start watching again. Growing up as a kid I was a huge NASCAR fan. 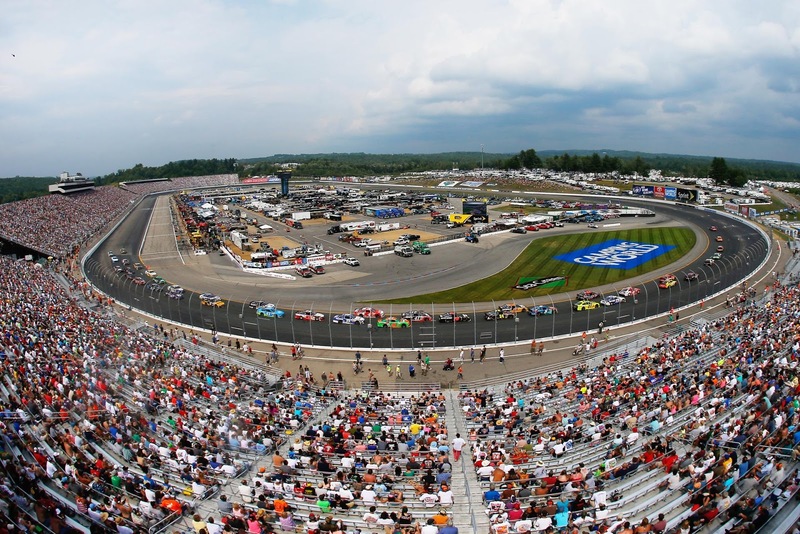 I lived in Concord, NH, which was a short drive to Loudon, home of the New Hampshire Motor Speedway. 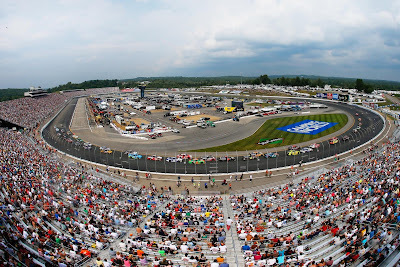 My dad and I saw several Busch and Winston Cup races there. I can't recall any specific races, except for one. 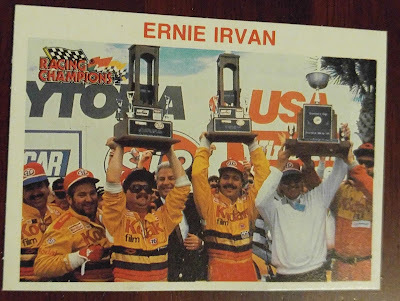 It was a Busch Cup race and I was really excited to see my favorite driver: Ernie Irvan. Of course Irvan crashed early on and was out of the race. My dad said I pouted the whole rest of the race. I also remember not having any interest in the rest of the race. 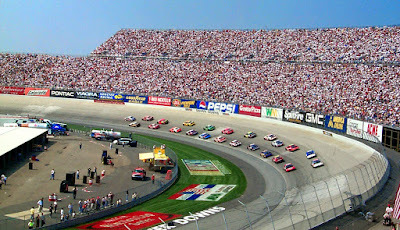 We would also make an annual pilgrimage down to Dover Downs in Delaware to make a weekend out of the races. 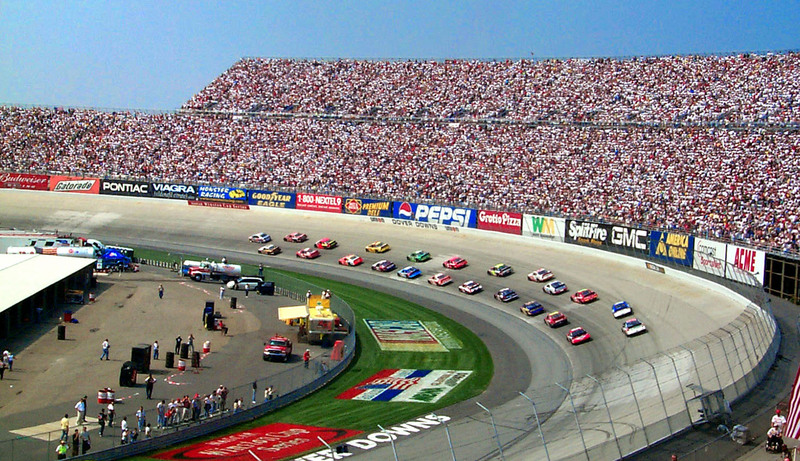 Dover, which is nicknamed The Monster Mile, was always exciting. The turns are banked a massive 24 degrees. It does not sound like much but it is steep in person. The high turns created a lot of action, i.e., crashes. We'd stay in Elkton, MD, which was maybe 30-45 minutes outside Dover. Near our hotel there was a go-kart track that was a lot of fun. Once my family moved out to the Northwest in the late 90s, it's fairly easily to pinpoint that as the decline in my interest in NASCAR. Most of the action is out on the East Coast so being three time zones away does not help. The drivers started to change and NASCAR itself also changed. There was a shift towards bigger tracks, which eliminated part of the charm for me. I attended the last Winston Cup race at North Wilksboro in 1996. North Wilksboro was a small track that made for more technical races. The track wasn't fancy but it gave the sport some character. Unfortunately, the track is a shell of its former self. 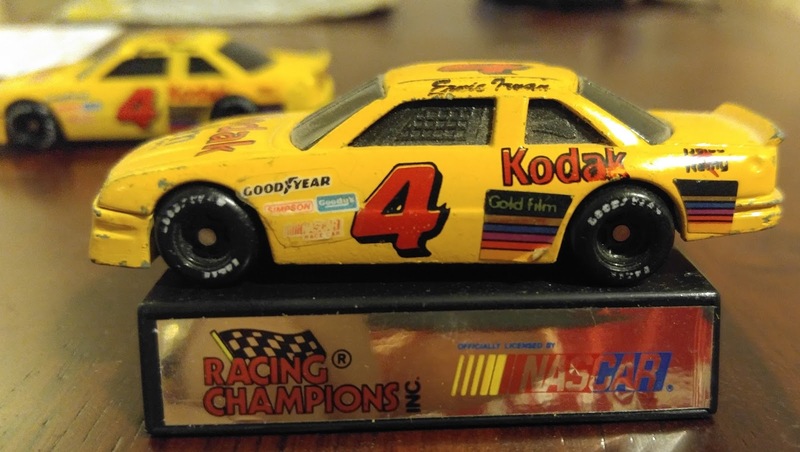 Turning to the title of this post, one of my favorite things about NASCAR was the diecast cars. I collected them every chance I could get. 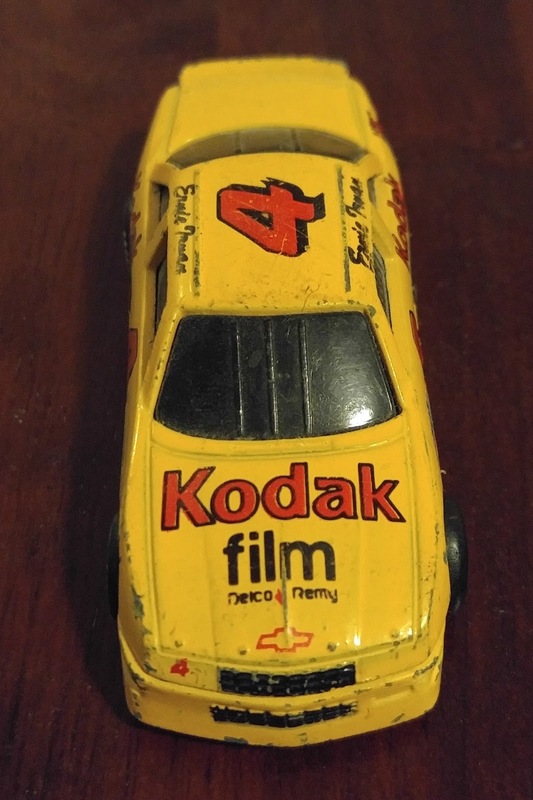 There were several Christmases where all I wanted were diecast cars. 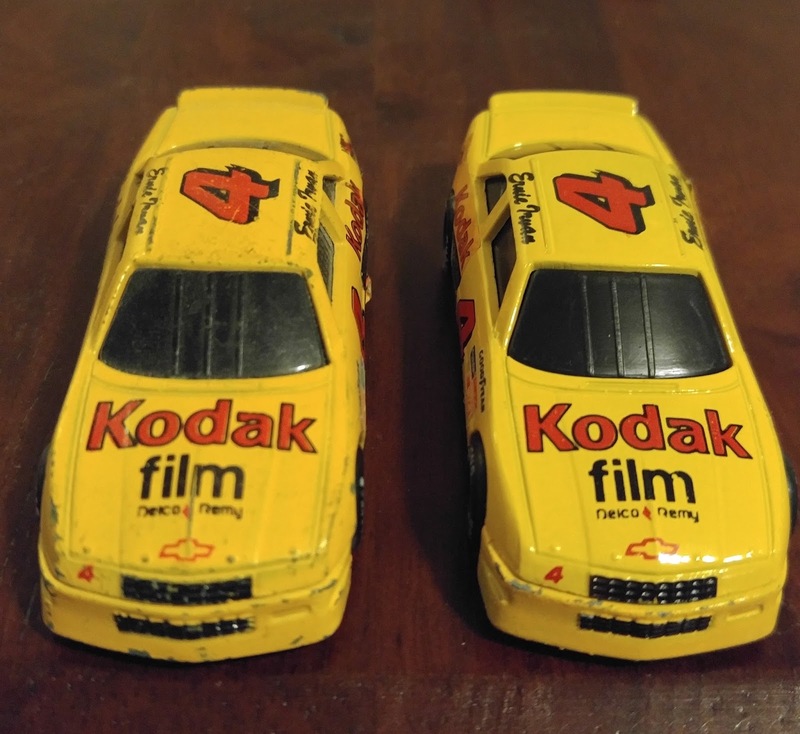 My first diecast car was the above pictured Ernie Irvan #4 Kodak car. How do I know it was my first diecast? Well it's the fact that it's all beat up. 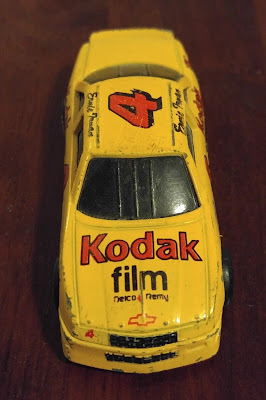 Before I knew that certain kids toys were supposed to be displayed and not played with, this Irvan car went in my giant milk crate of toy cars. I would toss the car in without any consideration as to whether the pain was being damaged. By the time I got my second diecast car, I realized that I should take better care of my NASCAR cards. Every car I got since then has been kept in great condition. All 50+ cars are now sitting on a shelf looking good. 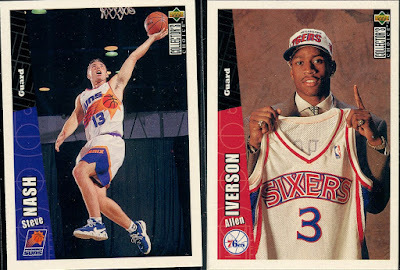 Billy over at Cardboard History made a post about correcting a mistake he made in 1995. I think his post finally encouraged me to correct a mistake I made around the same time. After a quick search on eBay, I found the same car in it's original package for only a few dollars. As you can see, the new car looks much nicer than the old one. No pain scratches, less faded, and no faded decals. I'm really happy with my purchase, especially since the cost was minimal. Apologies for the non-scanned photos as my scanner is currently buried in cards. I don't know if these cards are listed in The Trading Card Database but I should check. It's a basic card with minimal driver information. I don't expect anything more as this card takes a backseat to the card. I do like the celebratory color picture on the front. Don't expect NASCAR posts to make any regular appearances on this blog. I think I have at least one more in me but it won't be any time soon. I don't envy sports writers. I started to write the intro to his blog several times during the game before stopping. This was a game of peaks and valleys for the Cougars. As of right now, I thought WSU was done for as they had failed to convert on 4th down, down by 10 points with 6 minutes left in the game. Then two minutes later, WSU makes an interception and on the next offensive play, Luke Falk throws a long bomb to none other than Gabe Marks. 4:17 left and the Cougars trail only by a field goal. Boise State is about to receive the kickoff so I'm going to stop writing now. Alright. Ultimately the game came down to a WSU Hail Mary pass from about the 50 yard line. There were no Central Michigan heroics tonight as Falk's pass was well short of the end zone and batted down anyway. 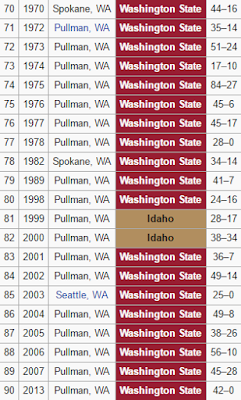 I truly believed WSU could have started this season 2-0 but instead they are winless on the year. Again, I think it's too early to lose hope for the season. That's not to say that I'm not worried, though. I'm going to cheer myself up by talking about cards. Saturday marked the start of college football all across the country and as per the recent tradition with Washington State University football, the Cougars lost their opening game. This marked their fifth consecutive opening day loss. And for the second year in a row, the Cougars lost to an FCS team. Last year that didn't post a problem as the team went on to finish 9-4 and claim their first Bowl win in a long time. I'm still optimistic for this season though, even if their record over the past decade would give any rational observer some doubt. Since I first started at WSU in 2003, the football team has been in disarray. Sure the Cougars went 10-3 in 2003 under new coach Bill Doba. However, that record was more of a reflection of former coach Mike Price who left to go to Alabama but was fired before even taking the field. In 2004, the team slipped to 5-6 and dwelled in the basement until last year when the team finished with a winning record. 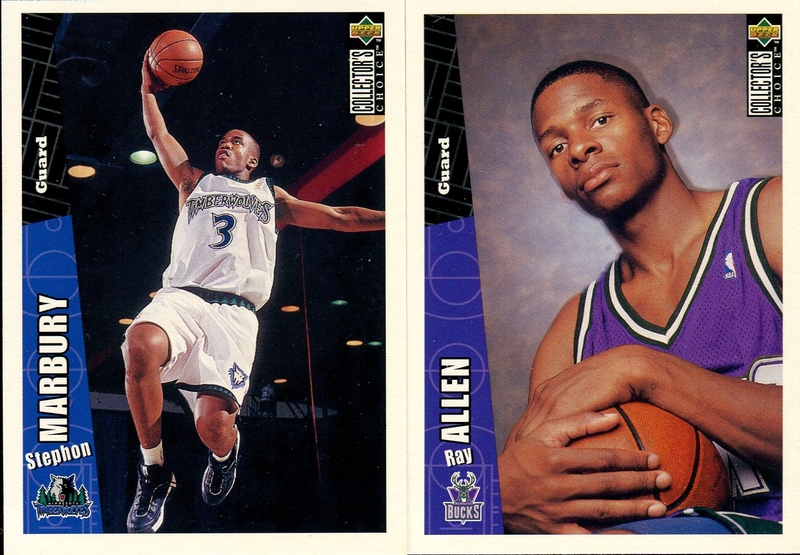 Despite these dark years, there have been a few notable players. I've made an effort to pick up some WSU cards as I previously had none. 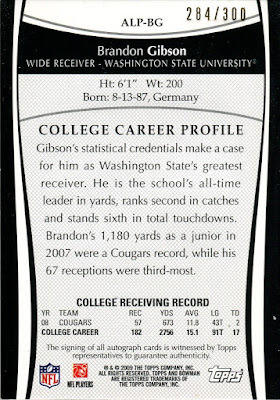 Brandon Gibson played during my time at WSU as he joined the team after it's 10-3 season in 2003. Unfortunately for him, he played as WSU made it's race to the bottom. Nonetheless, he had a breakout year in 2007, with 9 TD receptions and 1180 years. Gibson played well enough to be drafted by the Eagles. He ended up being traded to the Rams during his first season and spent three years with the Rams. Gibson then signed with the Dolphins where he played two years. Last year he signed with the Patriots but injured himself before the season even began. As of now, he is a free agent. Here's a highlight from his time in the NFL. Dom Williams was a product of the Mike Leach Air Raid offense. 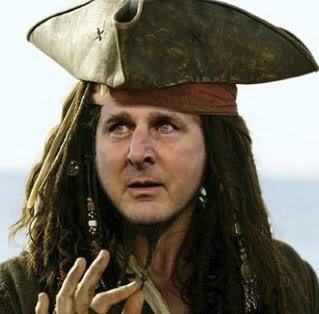 Essentially what that means is that Leach is going to throw the ball and then throw the ball some more. 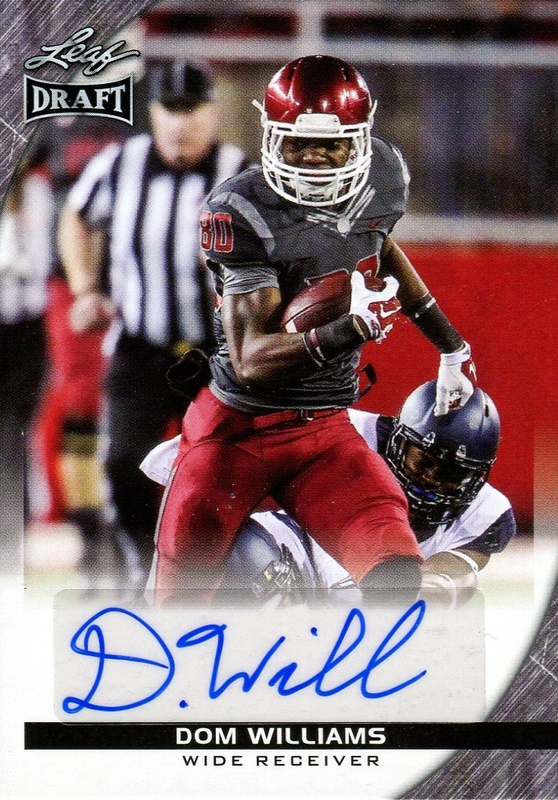 Dom Williams had 30 receiving touchdowns over his career at WSU, including last year's 4th quarter game tying TD against Oregon. WSU would go on to win it in a wild double OT, which is notable because that snapped an eight-game losing streak to Oregon. 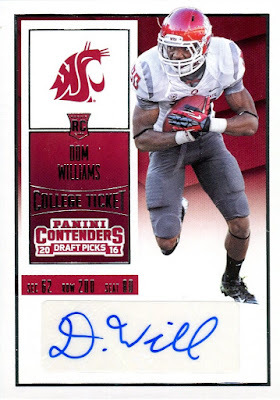 Undrafted in April, Williams quickly signed with the Chargers. He didn't make the 53-man cut but it looks like he was signed to the practice squad. He has the speed so I hope he can make it through the year with them. Two current players who don't have any cards are QB Luke Falk and WR Gabe Marks. Hopefully they get some recognition next card season as they are the backbone of the Air Raid offense right now. I have more WSU cards to post so I'm going to try and make this a weekly feature after every game.